This exhibit features a 35” long electromechanical robot arm mounted on a ten foot long rail system which allows the arm to glide from one end of the exhibit to the other. The exhibit's unique configuration allows the museum visitor to guide the arm by direct view through poly-carbonate windows and by simulated telepresence through a color monitor and camera which is directly mounted on the arm. The task involves retrieving and placing a series of colored spheres on appropriate pedestals within a specified time. If you are successful a congratulation message lights up and it also speaks it. The exhibit activity times out after a preset interval and resets the spheres to the exhibit floor plain. 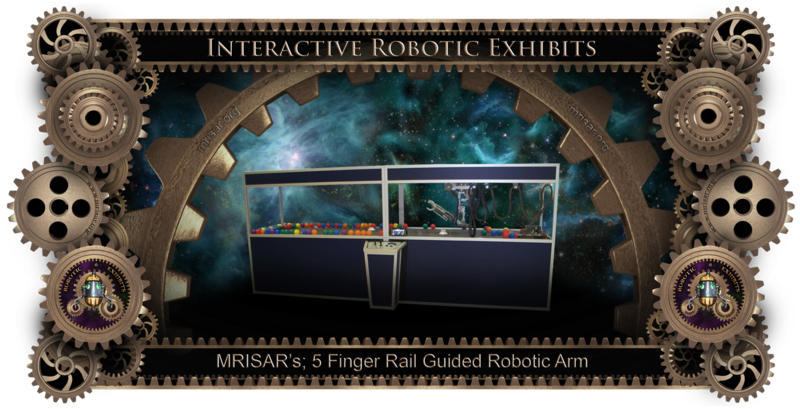 The exhibit challenges a visitor’s skill and dexterity while providing a unique format to study the engineering principles of a robot arm, while representing remote handling. Remote handling robots are used by industry, aerospace and commercial establishments to extend human capabilities in hazardous situations and exploration. The exhibit also provides hands on activities based on Telepresence Robotic Manipulation technology which encompasses devices for transmitting movements to a remote robotic device, allowing the manipulation of objects that are too heavy, dangerous, small, or in other respects too difficult to handle directly. The exhibit is designed to be visually stunning, educational and usable by virtually any age of museum visitor. The entire middle run of the exhibit is totally encased by clear poly-carbonate which allows dozens of people to view the exhibit while it is being operated. The electromechanical arm is designed in a totally open format, all the parts and the key components that operate it are visible for maximum educational merit, which relates to STEM. The 5 Finger Robotic version; each finger and thumb independently operate. The wrist turns, the elbow moves, as does the shoulder through both the horizontal and vertical axis. The fingers and thumb are actuated by solenoids. In all it has nine ranges of motion, not counting directional movement along the rail. The 3 Finger Robotic version; has movement in fingers and thumb. The wrist turns, the elbow moves, as does the shoulder through both the horizontal and vertical axis. In all it has five ranges of motion, not counting directional movement along the rail. The fingers come in either black or white UHMW. Each arm version has pressure sensitive and end of travel limits, and can adapt to any arrangement of objects stacked in its path. It is made of light weight 6061 Aluminum. It is especially designed with safety features and force limits. The rail is comprised of two tubular steel guides, aircraft grade cable and UHMW mounts. The rail combined with the reach of the arm allows a total reach of approximately 14’x 36''. The exhibit approximate measurements are 14‘ long x 80" high x 40” wide (less the control console). The control console adds an additional 16" to the width at the center of the exhibit which extends the center footprint to 56" wide. The exhibit also comes with voice feedback as a standard with no extra charge, allowing the exhibit to prompt the user as to the status of their progress. Exhibits are available in a wide variety of colors.